A novel baculovirus misexpression system is shown to be functional in insect and vertebrate embryos. Genetic interactions during Drosophila development have been extensively studied by analysis of loss-of-function mutations and by gene misexpression using P-element-mediated transformation. Although several developmentally important genes are conserved in other arthropod species, and their expression patterns have been characterized, establishing their function has been difficult because of the paucity of easily identifiable mutations and the lack of compatible misexpression systems. Oppenheimer et al. show that recombinant baculovirus can be used as a vector for misexpression of genes in a range of species, allowing questions about gene interactions to be answered in otherwise genetically intractable organisms. Baculovirus was chosen as a vector because it is relatively safe and easy to use, has a broad host range and has a large capacity for DNA inserts. Initial experiments - injecting viruses containing the Escherichia coli lacZ gene attached to the hsp promoter into embryos of Drosophila, the red flour beetle Tribolium, and Xenopus laevis - demonstrated expression of α-galactosidase in all three species. Expression was detectable in Drosophila and Tribolium within 2 hours of injection and a degree of region-specific expression was achieved, depending on the site of injection. Specific regions of Xenopus could also be targeted for α-galactosidase expression when embryos were injected after the blastula stage. The interaction between wingless (wg) and engrailed (en) has been well characterized previously in Drosophila (Figure 1). Expression of wg using the baculovirus system confirmed that ectopic wg induces expression of en in neighboring cells of the ectoderm. Ectopic Drosophila wg expression in Tribolium produced a similar effect, but only when wg was expressed in cells just posterior to the normal En stripe. 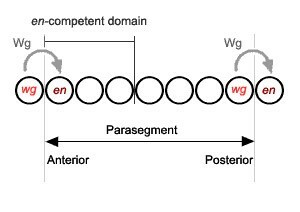 This suggests that an en-competent domain, similar to that found in Drosophila,also exists in Tribolium.The ectopic induction of en was shown to occur only within a defined developmental stage, and this is also analogous to the situation in Drosophila. Induction of engrailed (en) expression by Wingless (Wg) protein at the anterior parasegment boundary in Drosophila. The wg gene is expressed at the posterior parasegment boundary and the protein diffuses to neighboring cells. Only the cells on the posterior side respond by expressing en, however, as they are within the en-competent domain. Ectopic wg expression will induce en expression only within this domain. Supplementary material to Curr Biol 9:1288-1296 includes more detailed methodology. The interactive fly and GeNet, the gene networks database have further information on Drosophila wg and en and their interaction during development. Nipam Patel's homepage at the University of Chicago has some information on research in his lab. A Lab manual for baculovirus techniques is available online. This paper, and another in the same issue of Current Biology using recombinant Sindbis virus, represents a major step forward in the analysis of genetic interactions during development of non-model species by describing generally applicable systems for ectopic expression. In addition to the Xenopus work by Oppenheimer et al., both labs describe some success in using these systems in other non-insect species, opening up the possibility of a wide-ranging study of the conservation of developmental mechanisms.